Go Grippers Vehicles – Race Car 3 Pack is rated 4.9 out of 5 by 24. On your marks, get set and GO with the Go Grippers Race Car set! Vroom and zoom all around the living room on a race to Ha-Ha-Highway. 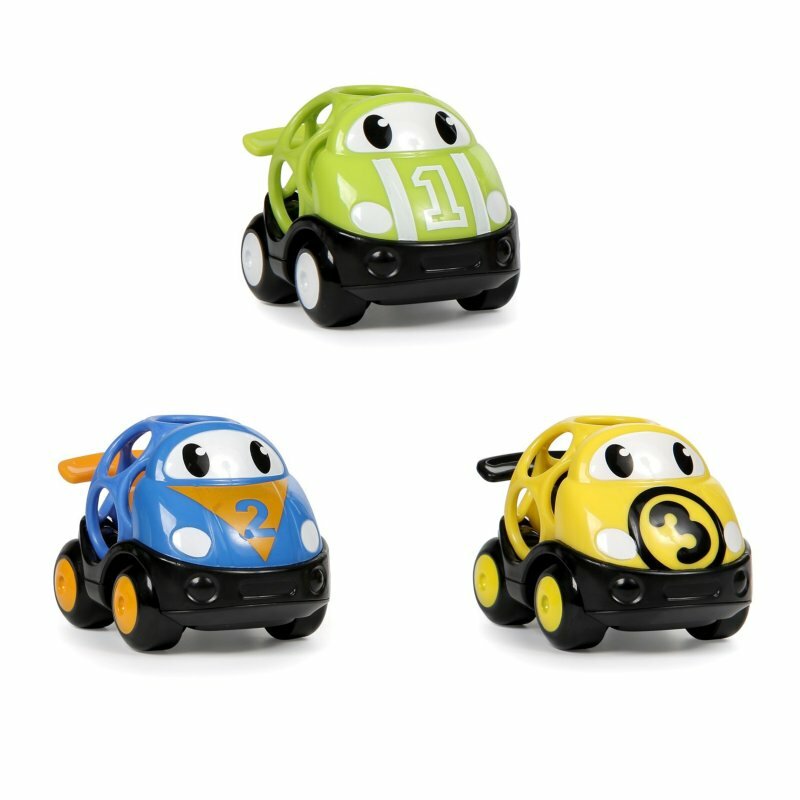 The signature Oball design is made with finger holes, so these cars are easy to pick up and impossible to put down! No need to pump the breaks on playtime, the virtually indestructible toy is built for speed and lasting fun. And with three cars in this package, little brother or sister can join in on the racetrack adventure. With laughter paving the way ahead, it’ll be a close call between you and baby to see who has the most fun! It's a race through baby’s imagination! Rated 5 out of 5 by Grandma Jo from Love the colours and easily gripped My grandson received them for his first birthday to go with his new Bounce and Zoom Speedway. Absolutely loves them. Rated 5 out of 5 by Allie from So much fun We have 2 sets of these cars (this set and the red set). My daughter seems to have a favorite color on any given day. We're already using these to start talking to her about colors. She's 7 months old, so I'm not sure how much is sinking in but these are great to use to have conversations with her. She loves pushing them around with her when she crawls and gumming on the wheels and spoilers. They're a great size for her little hands. Rated 5 out of 5 by tarapwhite from Great design - perfect for litte hands! I love the design of these toy cars. The Oball feature as well as the small size make it easy for those tiny fingers to grasp. In addition, the bright colors attract baby's attention. These are perfect first toys for babies learning to use their hands. Rated 5 out of 5 by VirginiaAshley from Love these little cars! My 16 month old loves these little cars. He loves to move them back and forth and grab them and go to a different surface to test them out there. They're about half the size of the Oball Rattle and Roll toy, making them more portable. We take these three everywhere. Rated 4 out of 5 by Adriane from My son loves these cars! We have had these cars for about a month and my son loves them. He takes them everywhere and is able to roll them. They are the perfect size for his hands. I cannot give it 5 stars because the packaging was hard to open and I ended up cutting myself on the plastic, so be very careful when removing them from the plastic packaging.